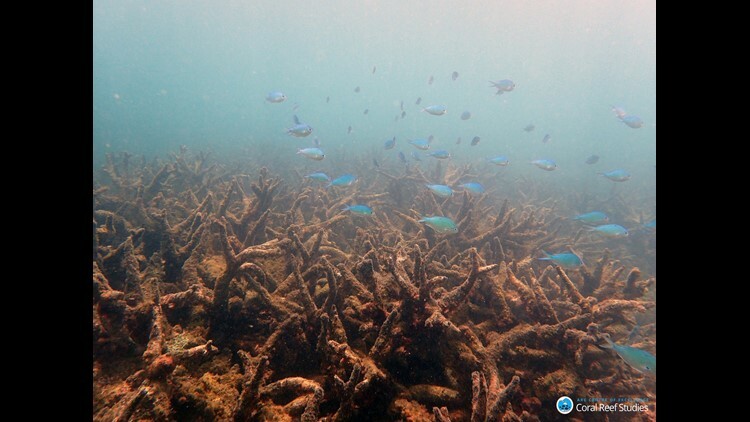 Staghorn corals killed by coral bleaching on Bourke Reef, on the Northern Great Barrier Reef, November 2016. A pair of scientific studies released this week pinpoint how climate change is impacting the world's oceans. The first study notes that heat waves over the ocean have become longer and more frequent over the last century, harming marine life and coral reefs. The study, published in Nature Communications on Tuesday, found an increase of 54% in the number of annual heat-wave days from 1925 to 2016. In the early 20th century, there was an average of two marine heat waves per year globally, but now there are three or four, the CBC said. “This means a marine ecosystem that used to experience 30 days of extreme heat per year in the early 20th century is now experiencing 45 marine heatwave days per year,” said study lead author Eric Oliver of Dalhousie University in Nova Scotia. The heat waves can have "devastating and long-term impacts on ecosystems," the study said. Recent unusual ocean heat has been linked to deaths of sea lions, whales, seabirds and crabs. "We can expect further increases in marine heat wave days under continued global warming," the study said. The second study found a major underwater current in the Atlantic Ocean, one that brings warm water from the equator up into the North Atlantic, is the slowest it's been in at least 1,000 years. That study was published Wednesday in Nature. Known as the Atlantic meridional overturning circulation, it is a key conveyor belt for ocean water and affects weather patterns in the Americas and Europe. Continued slowing of the circulation could make for more extreme weather across the Northern Hemisphere, especially Europe, and could increase sea-level rise along the U.S. East Coast, researchers said. A shutdown of the circulation was the premise for the climate chaos in the scientifically inaccurate 2004 disaster movie The Day After Tomorrow. Observed ocean temperature changes since 1870, and currents in the Atlantic Ocean. 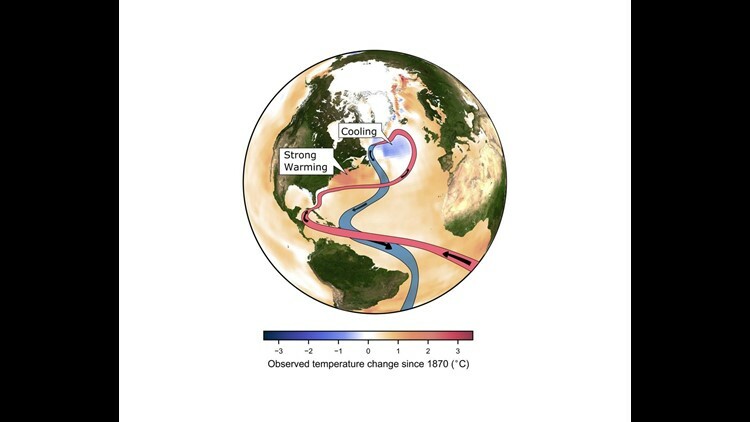 A study released on April 11, 2018 suggests global warming is likely slowing the main Atlantic Ocean circulation.